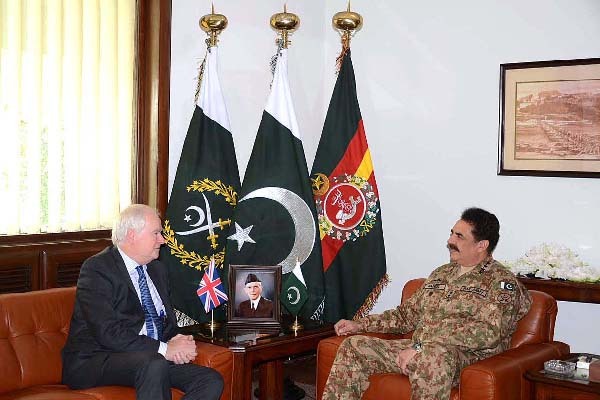 RAWALPINDI, Oct 24 (APP): National Security Advisor to Prime Minister, United Kingdom (UK) Sir Mark Lyall Grant, called on Chief of Army Staff (COAS) General Raheel Sharif here on Monday at General Headquarters (GHQ). Matters of mutual interest and regional security came under discussion, an Inter Services Public Relations (ISPR) news release stated. The visiting dignitary acknowledged the significant achievements made by Pakistan in their fight against terrorism and continued efforts for regional peace and stability.